A trip a week? NOW THAT’S TRIP! Enter the Steve Harvey Trip-a-Week Sweepstakes. You and a friend could win travel certificates to your favorite destination! A winner will be announced live on the Steve Harvey Show each Monday morning February 13 – April 30. Entering is easy, all you have to do is join BlackAtlas.com, and if you’re already a member, there’s no need to register. You’re automatically entered. 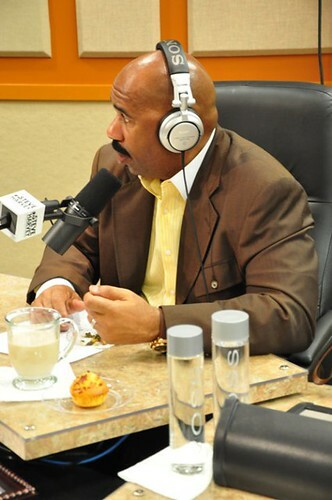 You can listen to Steve Harvey’s morning show online or go here to find a radio station in your area. Go here for complete rules and go here to enter. Good morning Steve and cast. My daughter and I listen to your broadcast in the mornings while I’m driving her to work. I can only thank God that I have not hit another car on the beltway as I find myself in continual hysterics at your antics. Congratulations on your new movie. Love you have a blessed day! Granny “K”.